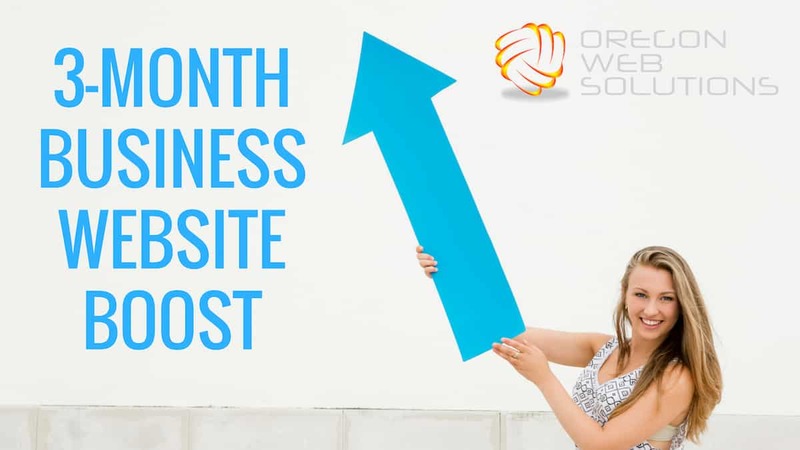 Oregon Web Solutions is now offering a 3-Month Business Website Boost™ marketing package designed to breath new life and revenue into your business. Over time, your online presence can become “stale” and even move into a state of decline. This results in fewer and fewer views on your website, and eventually fewer new customers and revenue coming into your business. Using a proprietary system, our 3-Month Business Website Boost™ is specifically designed to reverse this process and keep your website visible online. Seth Morrisey the Co-Founder of Oregon Web Solutions says, “We’ve designed our 3-month Business Website Boost™ package to give our clients maximum results without a long-term marketing campaign commitment. In fact, our package includes all the critical elements you need to boost your websites online visibility at a fraction of the price. Over the years our marketing agency has worked with clients both big and small and successfully helped them improve their online presence. We’ve learned that at the end the day clients want maximum results for the lowest possible price and that’s what this package is intended to do. Seth continues, “We’ve eliminated all the extra expenses and “fluff” included in traditional marketing campaigns, and instead just provide you the essential services you need to get results. Our 3-Month Business Website Boost™ package targets the first contact points a potential client is likely to have with your company.” These contact points include your Google Business Listing, Business Website, and Social Assets. “By making these first contact points more visible in Google and other search engines, we can dramatically increase the amount of new customers and leads to your business. Our goal with any client is to rank their website in the #1 position in Google and we’ve developed this campaign to give us the highest chance to do that,” says Seth Morrisey. Oregon Web Solutions has built a reputation as one of the top marketing agencies in the State of Oregon. Regionally located in Portland, Oregon Web Solutions has locations throughout the State including Bend, Beaverton, Hillsboro, Medford, and Seaside. Our services include search engine optimization, WordPress website development, social media marketing, website retargeting, and influencer outreach. Our team of internet marketing experts has the skills and experience to help you grow your company online and reach new customers. To claim your 3-Month Business Website Boost™ and to receive a no-obligation website video analysis simply fill out our Discovery Form. Next, our team of experts will go to work researching your online presence and then propose a marketing plan intended to grow your business. If this sounds like something that can help your business, visit our website today! Breath New Life Into Your Business Website with a 3-Month Boost! Overall rating:	5	out of 5 based on 48	reviews.